The unmanned Russian Progress 38 cargo ship launches from the Baikonur Cosmodrome in Kazakhstan on June 30, 2010 carrying 2.5 tons of supplies for the station's Expedition 24 crew. Full Story. A Russian Soyuz rocket blasted off Wednesday carrying anew robotic cargo ship filled with tons of supplies for astronauts living onthe International Space Station. The Soyuz rocket soared into space at 11:35 a.m. EDT(1535 GMT) from the Central Asian spaceport of Baikonur Cosmodrome inKazakhstan carrying the unmanned Progress 38 cargo ship toward the space station.The robotic space freighter will dock at the station on Friday. 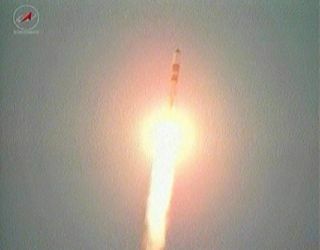 "Progress 38, on its way to the International SpaceStation," said a NASA mission commentator after the flawless launch. Known in Russia as Progress M-06M, the new Progress 38spacecraft is packed with nearly 2.5 tons of fresh food, clothes, equipment andother supplies for the space station's six-person crew. Packed aboard the spacecraft are 1,918 pounds (nearly 870kg) of propellant for the station, 110 pounds (nearly 50 kg) of oxygen, 220pounds (99 kg) of water and 2,667 (1,209 kg) pounds of dry cargo ? which includesspare parts, science equipment and other supplies. About 213 pounds (97 kg) of the delivery ship's cargo isearmarked as items for the station crew. Astronauts always look forward tofresh fruit and other foods that arrive on Progress spacecraft, NASA officialshave said. Some personal treats for the station astronauts aresometimes included, but NASA officials kept mum on anything unique riding onProgress 38. "Anything that would be of interest is probably asurprise," NASA spokesperson Kelly Humphries told SPACE.com from the JohnsonSpace Center in Houston. The InternationalSpace Station is currently home to six people: Three Americans representingNASA and three Russian cosmonauts representing Russia's Federal Space Agency. Progress 38 is scheduled to dock at the InternationalSpace Station on Friday at 12:58 p.m. EDT (1658 GMT). The cargo ship will parkat an aft docking port on the station's Russian-built Zvezda module. Earlier this week, the station crew moved one of its two Soyuzspacecraft from the Zvezda docking port to a different parking spot toclear the berth for the incoming cargo ship. Russia's disposable Progress spacecraft are similar inappearance to the three-module Soyuzspace taxis that ferry crews to and from the space station. Both vehicles have a propulsion and orbital module,however Progress vehicles do not have a crew-carrying module like the Soyuzships. Instead, Progress vehicles are equipped with a propellant module tostore fuel for the space station's maneuvering thrusters.